Saudi King Salman bin Abdulaziz met at his Riyadh palace with foreign ministry officials from Egypt, Djibouti, Somalia, Sudan, Yemen and Jordan “to look into establishing an entity for Arab and African states on the Red Sea coast,” Saudi Press Agency reported on Wednesday. They discussed ways to promote commerce and investment, as well as to protect shipping, Al Ekhbariya said. Gulf states have been taking a more active role in the Horn of Africa, which got a special mention in the communique issued at the end of Sunday’s Gulf Cooperation Council summit. 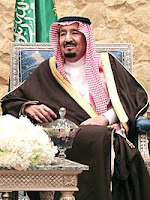 Saudi Arabia, for example, brokered a peace deal in September between Eritrea and Ethiopia. Eritrea is located near the near Bab el-Mandeb, a shipping choke-point on the Red Sea used by oil tankers and other cargo vessels en route to Europe and the U.S. through the Suez Canal. The United Arab Emirates has also been expanding its footprint in the region, though it wasn’t included in the grouping. Ethiopia and the breakaway republic of Somaliland, two countries with which the U.A.E. has good relations, also appear to have been excluded. Saudi Arabia and the U.A.E. are both part of a military coalition seeking to restore a friendly government in Yemen ousted by rebel fighters. Parties to the conflict are meeting in Sweden under U.S. pressure to agree to a cease-fire.